Based in Italy, Geoponica is a consultancy specialized in horticulture, agriculture, forestry and gardening, supporting customers across all phases of design and production. Geoponica provides guidance on production plans, fertilization and irrigation and integrated pest management for grapevines, fruit trees, nuts, soft fruits, aromatic and officinal herbs, horticultural crops and intensive industrial crops. 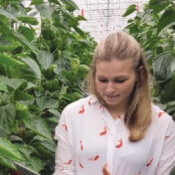 The company provides turnkey solutions for off-soil cultivation in high-tech greenhouses, offering remote monitoring and consultancy and technical training for employees in high-tech growing.